A lot of the worst Netrunner cards have the best art. I think Gingerbread is my (least?) favorite example. I LOVE the picture of this little guy run-run-running as fast as he can. I want it to be on my default sentry breaker! But no, they plastered this wonderful little scene on a coaster. Boooo, FFG! Boooooo! The new Kala Ghoda program Panchatantra combined with the current dominance of NBN might make this ICE breaker worhtwhile using. Both are only two influence so it's totally out of the question for anarchs, but shapers and criminals might be able to put it to good use. Maybe even Apex can begin using Gingerbread as a primary breaker. I think Gingerbread's time has finally come, but only in one very specific case. Apex. At least, an Apex that's predominately relying on Endless Hunger. I've seen a few people splash a Mimic in order to get around Apex's other big problem, Architect, but as I've played I've noticed that Apex's real problem is Tracer ice with an ETR sub. A Caduceus, Flare, or more likely a Viper on a central can really shut down your Apocalypse game and with no Apocalypse, Apex can be a bit toothless. Beating the trace isn't always an option as Apex can run a little poor and the Corp will generally have some idea when you're gearing up for the Apocalypse turn. Archangel, Assassin, and Ichi 1.0 are all cards that are seeing some play and can get rid of the one card you really need: Endless Hunger. Data Raven and Gutenberg are both problems if you can tell that their server is being guarded by Keegan Lane. Other then that, it's generally more beneficial to eat the tag and clear it later. Additionally, all those other Tracer ice that no one actually plays. It's 2 influence cost is partially mitigated by Apex's large amount of expendable influence, and with Heartbeat on the table you have just enough for Gingerbread and Endless Hunger. The chance for this card to emerge from the binder has been missed with the release of D&D. With there being 5 new tracers released in D&D, as well as the newly added Gutenberg and the resurgence of Ichi 1.0, I thought FFG might once again be able do its magic, taking a considered 'bad' card and making it shine. Unforutnately this is not the case. The reason being that two of the most powerful new tracers (Gutenberg and Archangel) have 6 strength, while Assassin has 5 strength and 2 subs. Meaning all these new ice are a whooping 5 and 4 to break with Gingerbread. This is a ridiculous amount for a specialist card like this, you are better off paying the trace. Unless you run Net-Ready Eyes in your criminal decks, you can seal this one in the binder for good. Worth of this card is measured in the amount of ice it can break, which currently are mostly sentries. Considering the influence cost and the faction it is in, it might not be worth it at the moment. If there are more barrier and codegate type ice released with the tracer subtype, that become popular, this thing will grow in strength. It is also good to note that this is from a deluxe expansion, which means it'll be around forever (with the current rotation) so it's time might come (and go) with the game's development. With Gutenburg arriving in the SanSan Cycle, and Checkpoint releasing with Order and Chaos, there is case to be made for using a solid Tracer-breaker. 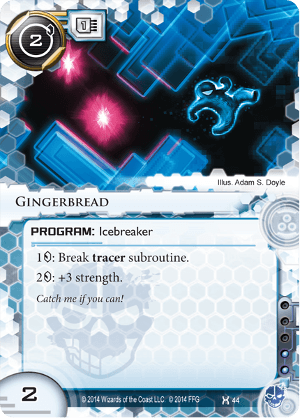 Of the 46 Sentries in Netrunner, Gingerbread can only be used on 20 of them, most of which are not played with much regularity. The average cost to break using it is 3 credits. It takes up 1 MU. I'm convinced that this card is extremely strong in Shaper, given the current Corp meta. Shapers do not have a good answer to the current mix of HB Foodcoats ice in particular, which is usually some mix of Ichi, Assassin and Vikram. Atman 4 makes you vulnerable to the latter two, Atman 5 to the first, so Atman is not a good solution. Cyberdex makes Datasucker support problematic. However, all three of these are tracers, all are broken by Gingerbread for the same cost or less as the rez cost (which is a fair measure of whether a breaker is efficient). It also backs up your Lady against NBN match-ups, meaning you can use Lady for Wraparound and Gingerbread for Resistor. 5 credits for Archangel seems bad, but that's the same cost as Gordian. 5 credits for Gutenberg is also bad (given that paying off the trace is 7), but if you're click starved rather than money starved (a common scenario) then paying 5 to avoid the tag and keep your clicks is better than paying 7. However, if you add in NRE then suddenly Gingerbread is one of the best breakers in the game for dealing with Archangel and Gutenberg. It's also as efficient as Mimic at breaking Caduceus. Given that Yellow and Purple are the dominant corps right now, tracers are everywhere. Gingerbread deserves a second look to fill out your Shaper breaker suite. I have not been disappointed with it. I've always saw this card as a corner-case until very recently. In fact, in a recent draft match it became my M.V.P. Cheap to install and to use: it can shine in the early game. It' important to understand that it's not a Killer and should not be considered as one. It breaks only 21 of the 46 sentries (after order and chaos) and is useless against non-tracer sentries like Archer, Fenris, Komainu, Grim, etc. But, against sentry-tracer, it's generally cheaper to use than Ninja and Alias. And compared to Garrote, it cost 5 less to install and need only . Since Killers are so expensive to use, adding Gingerbread to your deck is a good way to decrease the cost to break some of the sentries, but you'll still need a better killer in addition to gingerbread (probably Faerie). In addition, it can also be use for some code-gates: Checkpoint, Salvage, Viktor 2.0 and Viper. So the question is: does breaking tracer ICEs for 1 or 2 less worth the deck space and the ? Maybe, depending of your meta. And if you chose to add it to your deck, it's probably better as a one-of. I got excited about putting this in a Professor deck. Tracers are fairly relevant now, and will only become more relevant after Order & Chaos. Just as I was getting giddy, I remembered: this damn thing doesn't even break all tracer subroutines for 1 credit. Comparing this to Mimic is mind-boggling. Gingerbread doesn't qualify as a silver-bullet. This little idiot is the bullet you left at home, for good reason. I'm baffled why this card was printed as a Criminal card, and even more so at the 2 Faction influence. Tracers are almost always Sentries, and Criminals already have access to better Sentry breakers. Apart from the Sentries, there are 4 Code Gate Tracers and one of them is Salvage! Amazingly dumb.